After getting our Christmas tree yesterday and decorating the house (or at least attempting to get started), it just felt like a day for holiday treats and I always love a good excuse to make some yummy and fun baked goods with the kids! 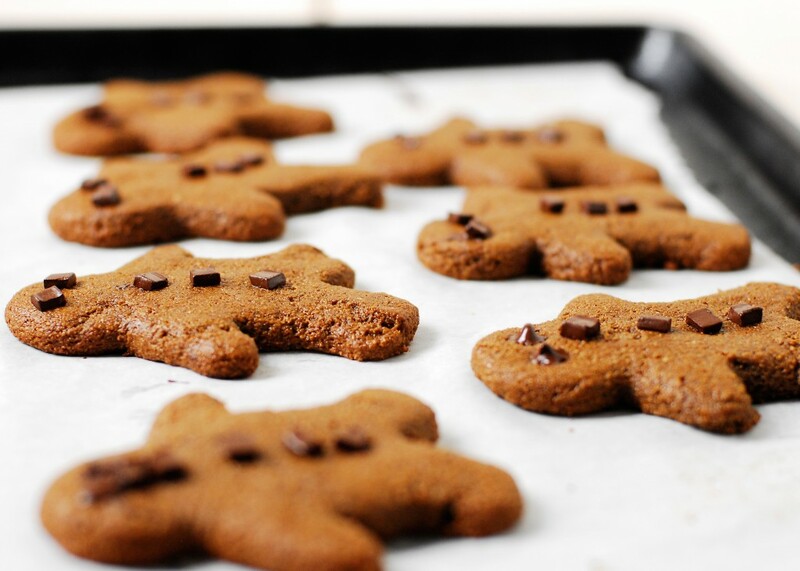 So, we decided on gingerbread man that of course were gluten/grain free, without refined sugars, and even vegan if you wanted. With the help of the kids, we made some of the messiest cookies you’ve ever seen but boy were they good! My husband actually asked me “are these gluten free”? He obviously doesn’t know me very well (only 25 years)! But I’ll take that as a compliment. In a sauce pan, heat molasses to a boil. Add maple syrup, palm shortening, and coconut milk to sauce pan. Stir ingredients until combined, then remove from heat. In a small bowl, combine all dry ingredients. Pour dry ingredients into wet, and mix with a wooden spoon until batter is fully blended. Roll out dough between two sheets of parchment paper, until about 1/4 inch thick. Cut batter with cookie cutters of choice. Make sure to rinse off cookie cutters after every 2nd cookie cut or it will start to stick and the cookies will not hold together well. Bake for 10-15 minutes on a parchment paper lined cookie sheet. Let cool, decorate as desired, and enjoy! Oh and Scott had to take a picture of me for something and when he was done, we noticed something very odd in the top left hand corner. Can you see it? Alice was actually the one to notice it first. When we cropped in a ton, this is what we found! 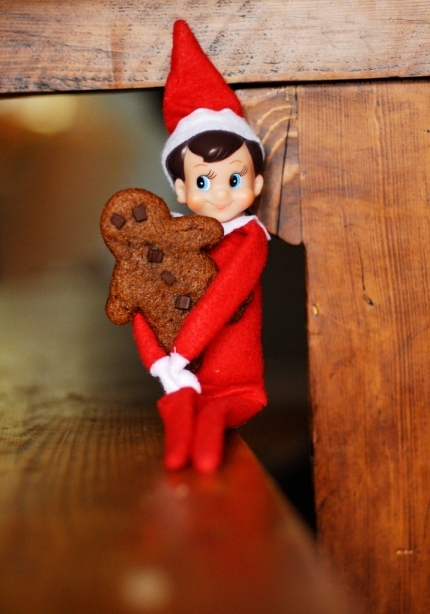 WOW, our elf is f-a-s-t! Guess everyone liked the cookies! Happy holidays!